Continue to Pray For Sweet Eddie- he continues to Recover! Eddie suffered a near death drowning several months ago and has been in special care as he continues to recover. You can follow his recovery on his Facebook page: Pray for Sweet Eddie and send him prayers as prayers continue to help! We will continue to send prayers his way from Physical Therapy Solutions and help him and his family however way we can. March 2, 2014. Tags: congenital muscular torticollis, Pediatric Physical Therapy, plagiocephaly, positional plagiocephaly. Newsletter Spotlights. Leave a comment. It is recommended to start physical therapy intervention as as soon as a parent or pediatrician detects a developing flat spot (plagiocephaly, brachycephaly). It is equally important for pediatricians and OBGYN doctors to educate new moms that may have a newborn that is at risk for positional plagiocephaly. 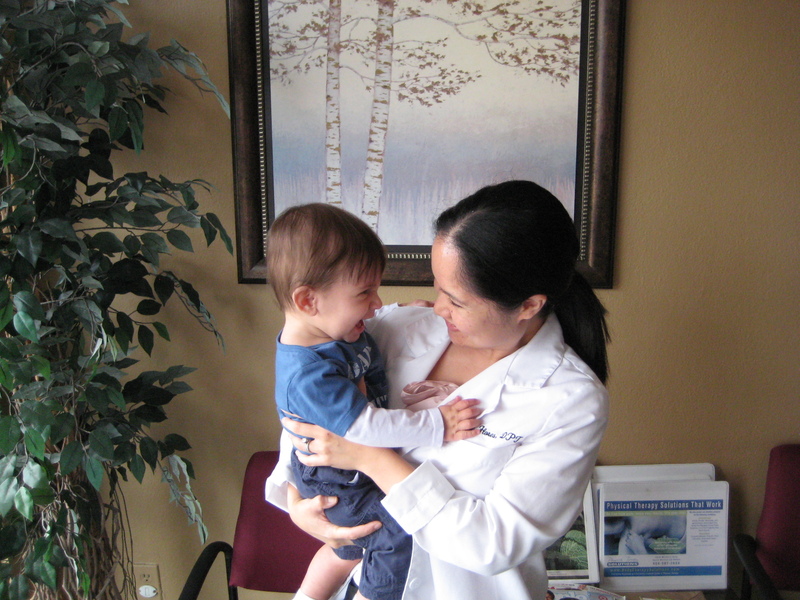 Usually, pediatricians and OBGYN doctors refer these moms to a pediatric specialist for a consultation. What are the risk factors? Intra-uterine constraint (first pregnancy, multiple birth, breeched/ transverse positioning, intra-uterine fibroids, larger than average infant head or body size, > 40 weeks delivery) and traumatic birth history (infant head in birth canal for long period of time, use of vacuum/clamp, emergency c-section or premature delivery). We recommend a physical therapy evaluation within the first two months of life. Physical therapy intervention could be as short as 2 visits: the first visit is to evaluate and educate the parents on what to do, the second visit is to follow up after a month or so to make sure the parents are doing a great job and the child’s head is looking good. Physical therapy intervention has a high success rate at improving and restoring head shape symmetry when initiated between birth to 3 months of age. In severe cases, however, helmet therapy is recommended. Helmet therapy is most effective when done between 5 months to 8 months of age, in conjunction with physical therapy. Helmet therapy eliminates the challenge parents have of sleeping their child ‘off’ the flat spot by offering an environment where nothing touches the flat spot 23 hours a day. Depending on the severity of the flat spot and the child’s age, the helmet is used for 2 to 5 months. 2) Initiating helmet therapy too early can result in the need for another helmet shortly after the child grows out of the first. 3) Helmets are costly with no guarantee that health insurance will cover it. On average, they are about $4000 depending on which center you go to. If we can help families save four thousand dollars with just physical therapy alone, we are all for it. 4) If the underlying ‘root cause’ of the plagiocephaly isn’t corrected by the time the helmet therapy is done, there is a chance of re-flattening. Here is an analogy: take a piece of play doh, putty or soft clay. Make a round ball out of it and place it on a flat surface such as a table. After a few minutes, you will see that the round ball begins to flatten where it is in contact with the table. The same thing occurs with infant heads which is impressionable from birth to 12 months: repetitive pressure on the same spot can cause re-flattening. If the child still has signs of positional ‘favoring’ (prefers sleeping with head turned or tilted to the left), it is likely that the original spot that was rounded out with the helmet can get dented in again over time. 1) Simply educating new parents on preventative techniques: if your pediatrician or OBGYN doctor does not refer new parents for a physical therapy early intervention session, parents can take the initiative to schedule this session directly with a pediatric physical therapist that specializes in head and neck challenges. We recommend doing this within the first 2 months of life. 2) As a new parent, find out if your newborn is at risk by looking at the risk factors listed above and seeing how many (if any) pertain to your pregnancy and birth history. If you identify with even 2 items on the list, it is imperative that you learn preventative techniques to start applying right away. Schedule a session with a skilled pediatric therapist to learn what you can do that is safe and effective. If your child has an obvious developing flat spot in the back of his/her head…. 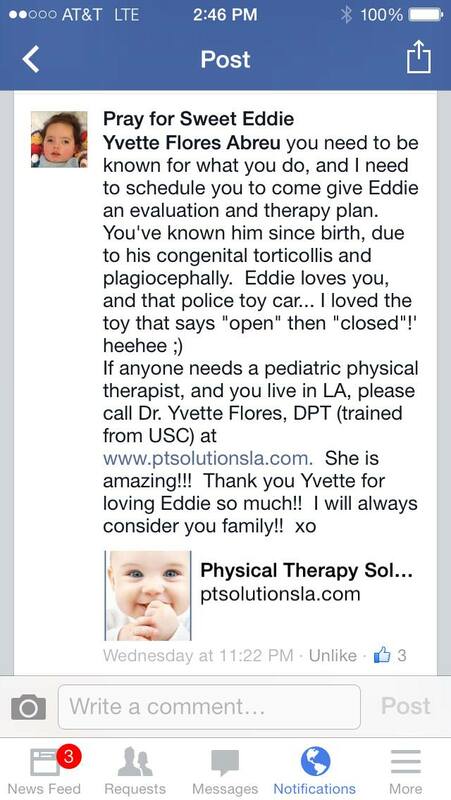 *Tell your baby’s pediatrician that you would like to schedule a consultation with a pediatric physical therapist. It is a smart idea to get the opinion of a physical therapist who specializes in head & neck challenges on your baby’s developing flat spot, to learn techniques you can start doing right away to prevent it from getting flatter, and to determine if you child is a candidate for a physical therapy (and helmet therapy) program. A referral or prescription for a physical therapy evaluation is not required in the state of California (and possibly other states). Should your child benefit from a course of physical therapy, the therapist can then get the prescription from your pediatrician. January 15, 2012. Tags: brachycephaly, congenital muscular torticollis, cranial banding, DOC band, early intervention, helmet therapy, Pediatric Physical Therapy, physical therapy evaluation, plagiocephaly, positional plagiocephaly, traumatic birth history. Early Head Start, FYI's for New Parents. Leave a comment.